The safety of our students is our top priority. 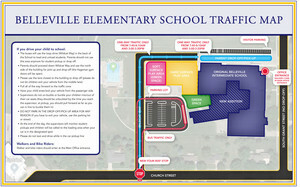 Please review the Belleville Elementary Traffic Map to help us make student drop-off and pick-up as safe and efficient as possible. If you are dropping your child off or picking up from school, please drive down Church Street and enter the school property via Wildcat Way in the back of the school. Do not enter the bus loop, but instead follow the blue line in the graphic around the playground and to the north side of the building. Drive in the lane closest in the school to let your child exit and enter the vehicle from the passenger side. Please do not park or get out of your car in the drop-off lane. If you need to exit your car to assist your child, please park in one of the visitor parking stalls on the north side of the building. The cafeteria doors will be locked, so please do not use the parking lot in the bus loop. We do encourage you to foster your child's independence by letting them unbuckle their seat belt and walk into school unassisted! We have supervisors that help with that! Please note that the blue loop (parent pick-up and drop-off lane) will be one-way traffic only during the morning and afternoon times. Please do not enter the north parking lot from Grant Street between the hours of 7:40-8:10 am and 3:00-3:30 pm. You will need to enter from the drive at the back side of the school. Students riding the bus will be dropped off and picked up in the loop outside of the cafeteria. Please allow the buses to exit the loop and do not block the intersection. Walkers should enter the building at the main entrance. Students that are tardy should also enter through the main entrance and then go to the office for a tardy slip. Please do not park your vehicle in front of the school on Grant Street. This is a fire lane and should not be used for parking at any time.